InstaWeather Pro (iPhone, iPad) - Weather Overlay for Instagram ~ Android Forever! 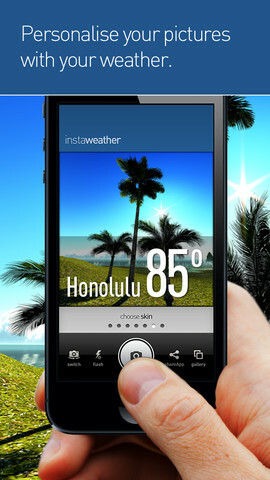 Developer Quote: "Make your friends jealous, place a perfect weather report on top of your Instagram photo." 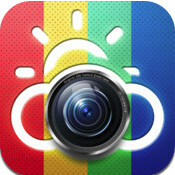 Wherever you are, snap a beautiful photo and overlay one of nine weather skins for an unforgettable pic of what it's like there; then share the photo with your friends on Instagram via any number of other channels like iMessage, email, Facebook, Twitter, etc. Make them jealous or happy for you, whichever is their bent. Features: You can easily choose your favorite skin from 9 available with various weather data: from current temperature and simple info about the location to very detailed forecast with air pressure, temperature, rain, wind power and direction. 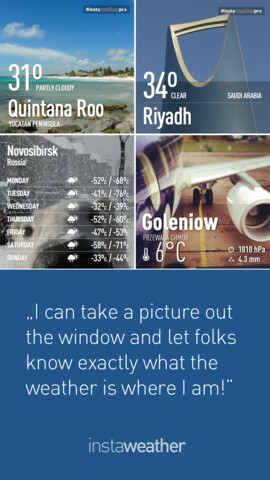 Click on the icon below to download InstaWeather Pro from the iTunes App Store!